I organized a group that ended up being 18 people at the original location last night. A couple of people are LTH members, so they can chime in too if they see the thread. The general sense was that everybody had a good time, most people enjoyed their food, nobody seemed to be overwhelmed by it. The one miss I heard about was the soft shell po boy. 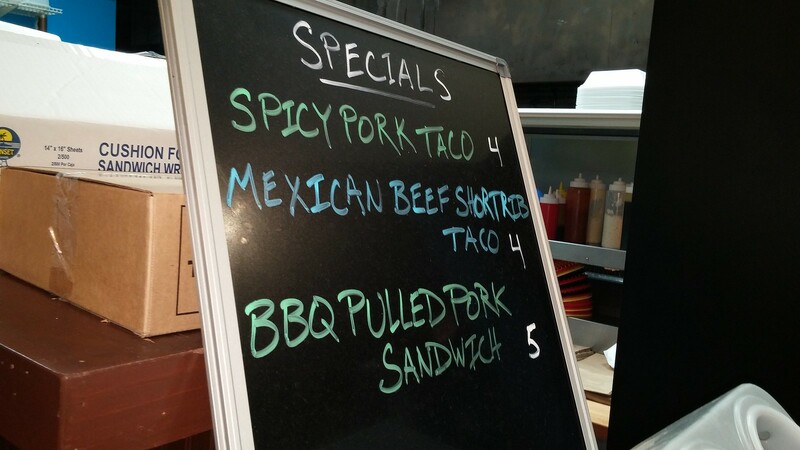 I ended up having a short rib taco and a Hercules burger. I enjoyed both of them, thought the value was reasonable but not tremendous (about $13). I liked the fact that they had their own parking lot - with their location being close to the Ontario ramp to the Kennedy, it's a place where I can see myself stopping in for an small dinner now and again. I came here last night on a company outing, and had one excellent taco and one not bad taco. The Hawaiian is probably the best braised pork taco I've ever had. Perfect balance of shredded pork, charred pineapple and spice-laden broth. Sometimes I eat something that has me shaking my head because I can't figure out how they make it so well; this was one of those times. The Samurai is OK. I was kind of surprised since the place is known for fish tacos and seafood. With the sweet French-dressing-style sauce and the shredded lettuce, it reminded me of eating a Big Mac more than anything else. The fish got lost in the mix of the other flavors. The rest of the big menu has me intrigued, I'll definitely be back on my own dime. Ate at the Lakeview location last night. First time that I had the foie gras fries. I thoughorly enjoyed the medallions but not really the fries. The friend I went with lives local & "his" fries were fantastic, he orders the truffle fries, then has B&L crack two egg yolks on top of the hot truffle fries, whoa was this great! Friend raved about the carnitas tacos. I had the al pastor burger and was a VERY happy camper. Loved the BYOB aspect of this location also. Went to the location on Orleans last night (9/19/14) for my friend's inaugural visit. B&L is still killing it. Not sure if you're talking just yolks, as there is an option of having 2 fried over-easy eggs on their truffle fries. I had 3 delicious tacos. 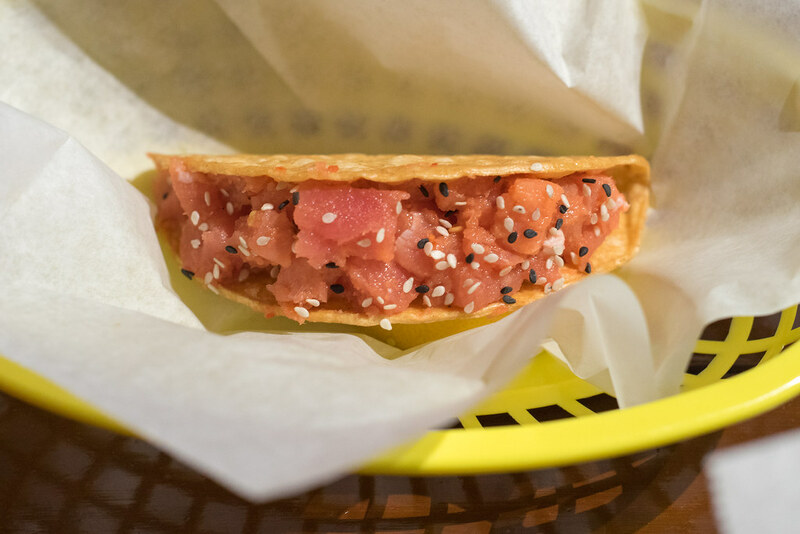 The Raw Ahi Tuna, Mahi, and one of their specials -- the Mexican Beef Short Rib. Though delicious, the short rib was a bit dry. 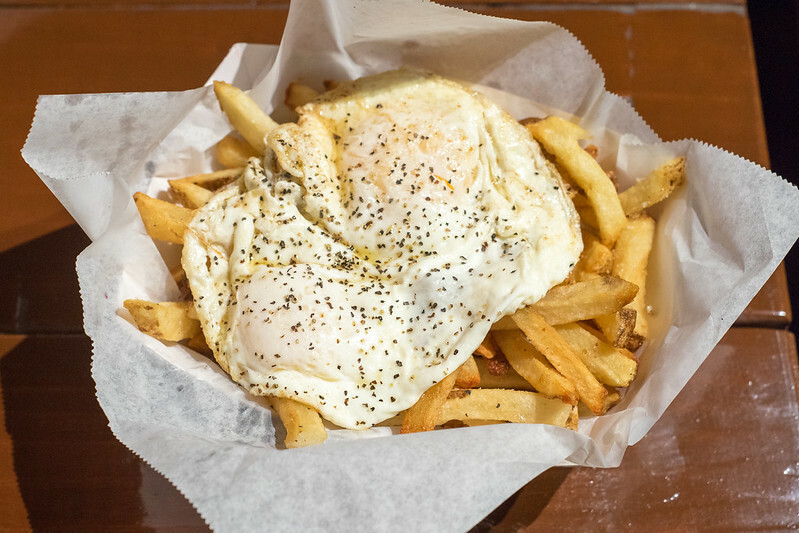 Whoa, those eggs over fries bring back good memories. Growing up, my Mom would make thick fries from potatoes we kept in dirt in a dark corner of the basement. We would pick them in the fall and keep them in dirt. 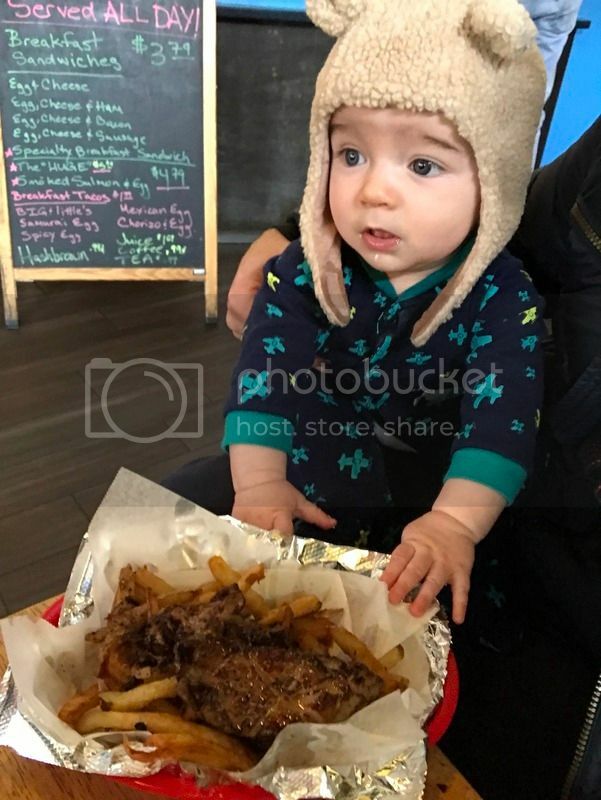 The fries were always top shelf and why I have a soft spot for home cut fries to this day (actually will be making them today). Anyway, she would make those and then fry up the eggs. My sister and I would dip the fries in the yolk and nirvana. We talk about those lunches all the time. Thanks for the memories. 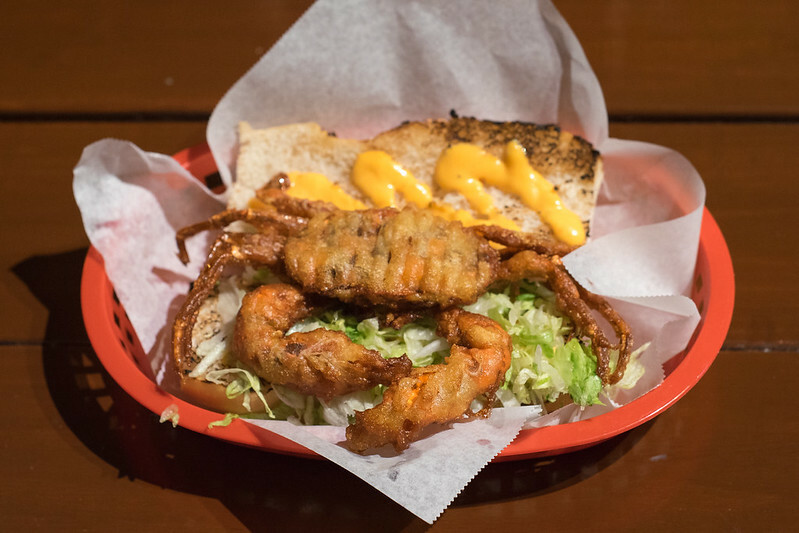 Big & Little's, a popular fast casual joint with somewhat of a cult following for its hearty po' boys, fish tacos and truffle fries, has arrived to Wicker Park's Milwaukee Avenue. have enjoyed lunch at this location several times, but recently braved dinner, and am sad to report serious service trouble. perhaps the trouble stemmed from from takeout/delivery orders. the line to place orders to eat in was staffed only by single person, who was also manning the phone for to go orders; he took over 30 minutes to process the merely 4 parties ahead of us in line (!!!). It then took another solid 30 minutes to receive food; when checking upon status of food at the 20 minute mark, we were told gruffly our order hadn't even entered the kitchen yet (and expeditor literally said "it's his fault" (about the front-of-house guy). but there were numerous tickets at the expeditor's window for to-go; wait in between names called for in-house eating was long -- the kitchen was putting out like 5 to go orders at least for every in-house order, despite place being full. exasperation of every customer in the dining area suggested super slow service consistently across the 90 minutes we were there. hope they can get it together staffing-wise; at a minimum of they're going to operate this way, with to-go clogging entire in-house operation, there should be communication at the end and at the front of the line of the wait to receive food (a courtesy employed at lots of of other busy, well-crafted places in the neighborhood, like Small Cheval etc). annak wrote: have enjoyed lunch at this location several times, but recently braved dinner, and am sad to report serious service trouble. oh, sorry to be unclear, the new Wicker Park, opening of which is related in the post directly above mine and hasn't been written about otherwise. Orleans St. location still firing on all cylinders. Big(Gary) was manning the counter and they were doing a brisk business at 12:15. Medium Rare Al Pastor Burger and fries with truffle salt and a side of Merkts hit the spot. 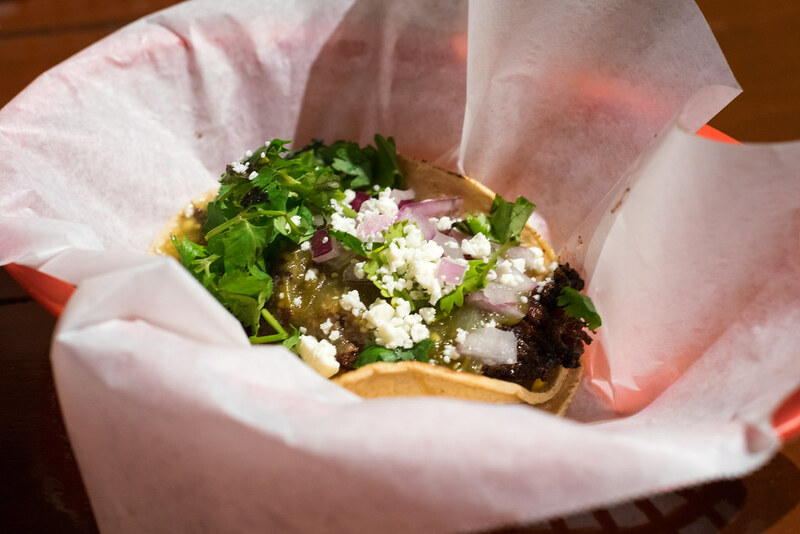 As a disclaimer, the al pastor is fried pork belly bits as noted on the menu. I've been to the Orleans location several times recently and it remains on point each and every time. The most recent time in the other day I noticed that they moved the furniture around a little bit, with the booths being in the "front" now and the picnic tables/benches being moved into the other room. My question is, how much longer does this location have? There is a ton of construction going on in the area, and I noticed that the building and lot are up for sale. I have not heard of anything imminent, just wondering. I agree, I used to go to Orleans all the time but after moving to Lincoln Park I've frequented the Lakeview location a few times and it's just not the same. If I have the time I'll still go back to Orleans because it's just that much better. We tried this place close to four years ago. Got a burger, fish and chips and some fries. 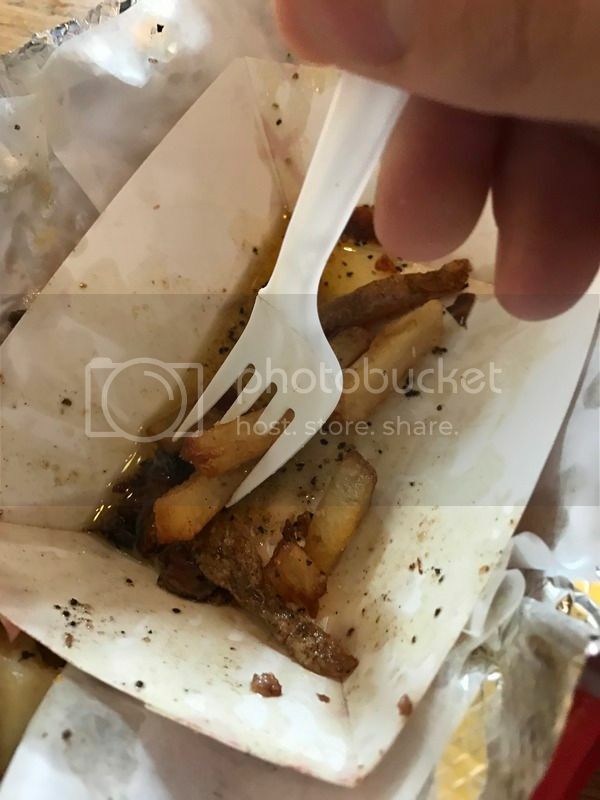 Seemed alright to me but nothing special, the batter on the fish slipped off too easily and the fries were not crisp, and even then the prices were never as good as the beginning of this thread indicates. However, some coworkers suggested the Orleans location for lunch recently so I got to try them again. I got a flight of tacos: Samurai, Mahi and Hawaiian based on suggestions here. I don't think any of them rose above mediocre and it was definitely not cheap (though I did not pay on this occasion). My coworker's egg was also overcooked such that the yolk was not runny at all on her still not crispy truffle fries. She was quite disappointed. I should point out that my coworkers generally enjoyed their meal more than I did, so take this as you will. Checked out the Lakeview location yesterday after Saturday Audio Exchange. Although not on the menu, I was happy to find that foie gras fries are still a thing. If you love foie gras, and haven't had these, you're missing out. If you "prefer a torchon or a mousse", then you don't love foie gras. Stay away, and ask your parents where they went wrong. Keep on - with the force don't stop. Don't stop 'til you get enough. I went to Big & Little's for the first time in ages today (Belmont location) and discovered, to my joy, that they've improved the fish & chips dramatically. The batter is lighter & thinner, and now consists of two rather substantial fillets instead of three smaller chunks. The portion is larger (so much so that my usual side taco turned out to be wholly unnecessary). I'm not sure when they changed it (again, I haven't been there in months), but I found it a pleasant surprise. ETA: Ok, I've re-read the posts in this thread, and either I'm insane, or the Belmont location had previously served something different from the Orleans location. "I've always thought pastrami was the most sensuous of the salted cured meats." Independent George wrote: I went to Big & Little's for the first time in ages today (Belmont location) and discovered, to my joy, that they've improved the fish & chips dramatically. The batter is lighter & thinner, and now consists of two rather substantial fillets instead of three smaller chunks. The portion is larger (so much so that my usual side taco turned out to be wholly unnecessary). Unless something recently changed, I know the Orleans location is the only one that offers Cod for their Fish & Chips. There is also a half-sized portion available. The Belmont and Wicker locations offer Mahi Mahi, Tilapia or Whitefish for their Fish & Chips. Went a couple weeks ago to the original location. I have been going here since they opened in 2010, and I think the quality has slipped. Both the fish and chips and the soft shell po boy were overly soft and greasy, I think indicating the oil temperature was not high enough. The burger we had was a sloppy overcooked mess compared to what I remember. The kicker was I felt the place itself was dirty. I understand it is a fast food restaurant and a little of that is to be expected, but the tables just felt like they all had a layer of grime that needed to be thoroughly deep cleaned. On the plus side, the poke tacos were still fantastic! Big & Little's on Orleans was, is and remains my favorite fish and chips in Chicagoland. Big & Little's, Count me a Fan! 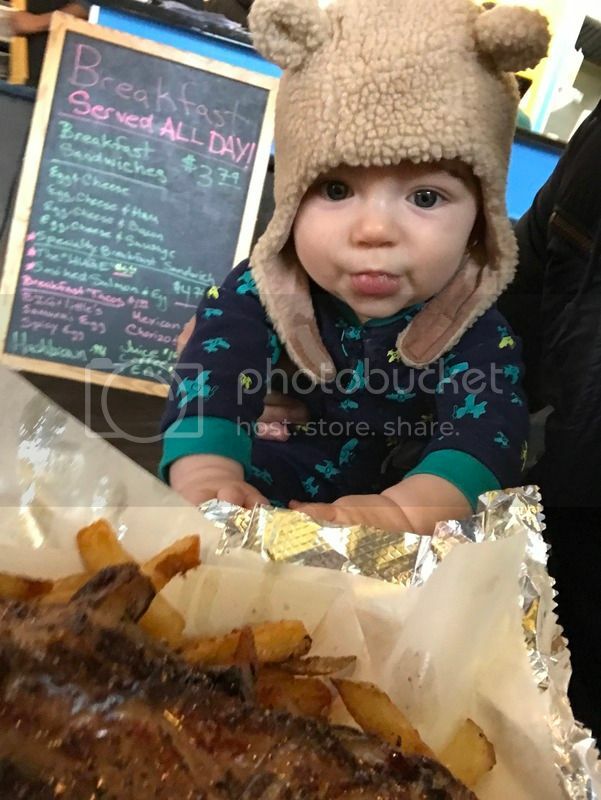 G Wiv wrote: Big & Little's on Orleans was, is and remains my favorite fish and chips in Chicagoland. When I got this notification it jumped me to your visit in 2013 where you proclaimed Boston Fish Market your favorite. Has this jumped to the top of your list or is it semantics (in Chicago)? Panther in the Den wrote: When I got this notification it jumped me to your visit in 2013 where you proclaimed Boston Fish Market your favorite. Big & Little's on Orleans is cod, perfectly fried moist flaky cod, and a giant portion at that. I don't remember ever having cod at Boston Fish Market, though I absolutely love love love BFM's perch and have raved about it on LTH more than once. I also like, a lot, Pleasant House Pubs Friday fried whitefish and chips. B & L Orleans has been my favorite fish and chips for a while as I love a good cod piece, deep fried of course. I should add BFM has wonderful walleye as well though, lately, for me at least, whenever I feel like going to BFM I think of the quote attributed to Yogi Berra, "no one goes there anymore, it's too crowded"
I would think that a deep-fried codpiece would be painful. By any chance, do you mean Fullerton and Sacramento (NW corner)? If not, where is it in relation to Spilt Milk? Is it the building with some blue and yellow trim, a gravel patio and fire pit? sorry, i meant sacramento and fullerton. there are not 2 B&L's going up in logan square! you have the right building. Big & Little’s Restaurant and Bar should debut in late November or early December at 3000 W. Fullerton Avenue in Logan Square. Very smart, that's like 2 blocks from MOCA Dispensary. Well played B&L. To my dismay, the new location doesn't have any of my favorite items (po boys, anything with pork belly, burritos). It's like getting really excited for xmas and finding out your parents got you the wrong video game system.